The Carthaginians did not think that the Romans, or anyone for that matter, could stop them from taking world. Hannibal had defeated the Romans with the tactic of circling around them and had taken the Romans and Scipio down. However in 202 BC, Scipio returned to Rome and wanted revenge and take Hannibal down to his knees. However, Scipio used the same tactic as Hannibal did when they had the first Punic War. 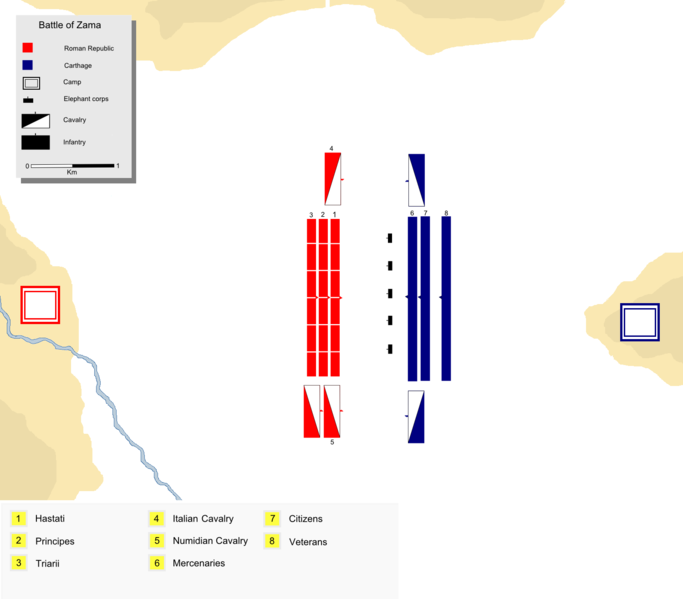 Scipio turned the tables on Hannibal by having three rows of his army, which only had 34,000 in infantry and 9,000 men in cavalry, but had the infantry all according to the best warriors. “The Hastati first, with an interval between their maniples; behind them the Principes, their maniples not arranged to cover the intervals between those of the Hastati as the Roman custom is, but immediately behind them at some distance, because the enemy was so strong in elephants. In the rear of these he stationed the Triarri. On his left wing he stationed Gaius Laelius with the Italian cavalry, on the right Massanissa with all his Numidians.” (Polybius) The Hastati, Principes, and the Triarri were all according to the classman of the Roman army. The reason why the Romans had won even with the disadvantage is that they had blown horns to scare the Carthaginian war elephants and the elephants almost completely wiped out the left wing side of the Carthaginian lines. With the elephants out of the way, Scipio made the Romans go behind the Carthaginians and stab them in the back as well as surrounded them, and ultimately destroying them in the second Punic War.